I'm having so much fun wearing this loose, breezy tank that was gifted to us at the Kelly Wearstler cocktail party a couple weeks ago. It's become a perfect addition to my summer closet of light drapey pieces. The OC's been scorching hot recently, but not having to carry an extra jacket around is nice. I love finally being able to consistently tan my arms and shoulders and God knows my legs need some sun. My daily wear is already transitioning from floral blouses to a full blown shorts and tanks kind of summer early and my way of celebrating the season is with these new espadrille wedges by Burberry. I've been searching the perfect ones and all I've come across are ones with platforms, which tend to look chunky on my feet. Finally found these beautifully designed babies with just a hint of the iconic check. They're versatile and surprisingly comfortable, so I'm definitely packing them up with me to Miami in a couple weeks. Check them out at Bloomie's, they're on sale at a great price! Love this outfit and might I add you have beautiful hair. You look beautiful in these photos! And you've reminded me, I really need some white denim! Cute summer look~ I love the top with the white capri's~ and those wedges~ Fabulous! Great look, very clean and chic. The whole style is gorgeous, you've just styled it all so well, I love the colours you used and how you mixed them! 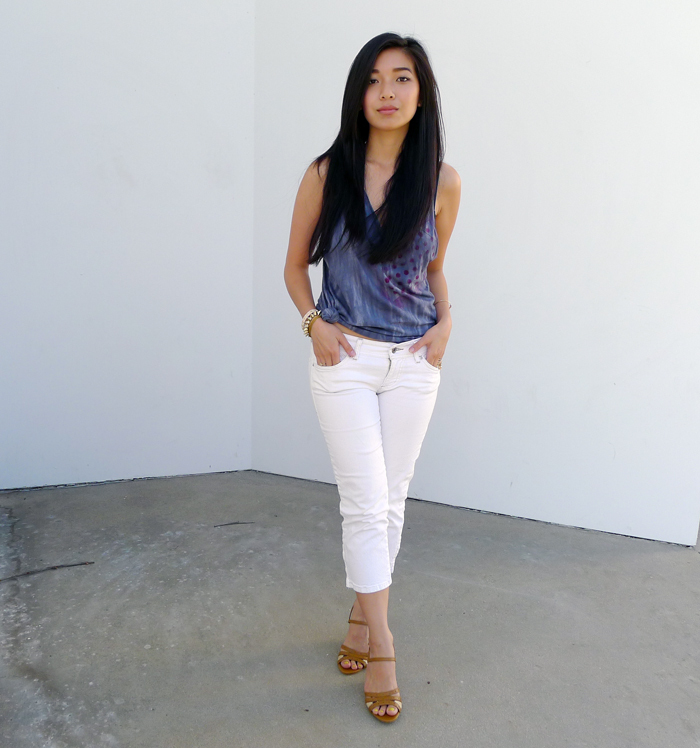 I love the Guess jeans with the Kelly Wearstler top - SO perfect for warm-weather and looks comfy too! I absolutely love the colors in your top! I loveee this look! The colors are gorgeous on you! Love your shoes too, they are somewhat similar to a pair a just got (that I'm obsessed with). There's something so special about getting to wear something of someone related to you. I think it gives the clothing a bit of character that getting it right off of the shelf doesn't. Can't believe how well they fit for not being yours right off the bat. Jealous of your Wearstler tank - wish I had been there. Lucky girl . Psh girl. Hand me downs are the best. You look beautiful! I love your blog! Love the nail polish on your toes! :) Haha! I love how relaxed this outfit is! 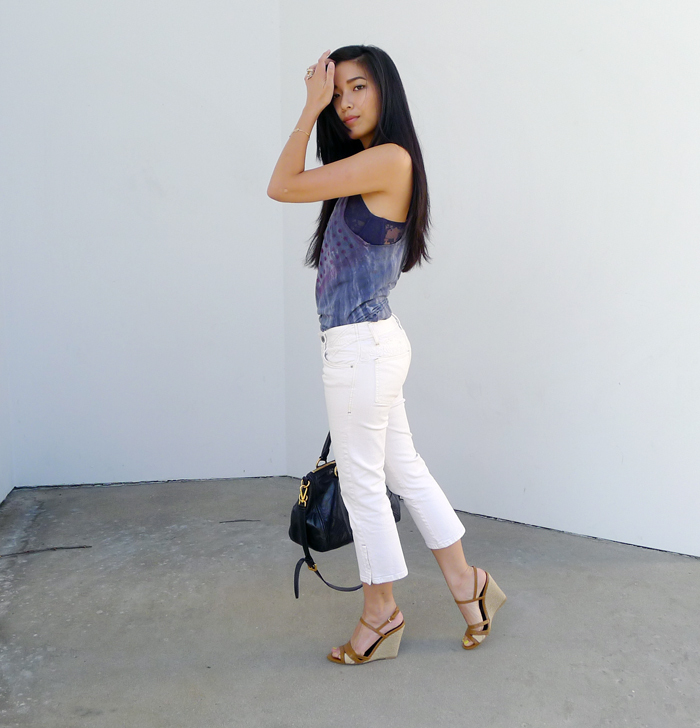 Has such a laidback summery feel to it and those wedges are gorgeous! You look beautiful! I adore your shirt! I'm in love with those wedges! Gorgeous outfit :) I need more white in my wardrobe! So glad I found your blog, it's amazing :) new follower here! Love your top. I have a diy tutorial for a top just like that coming out soon.